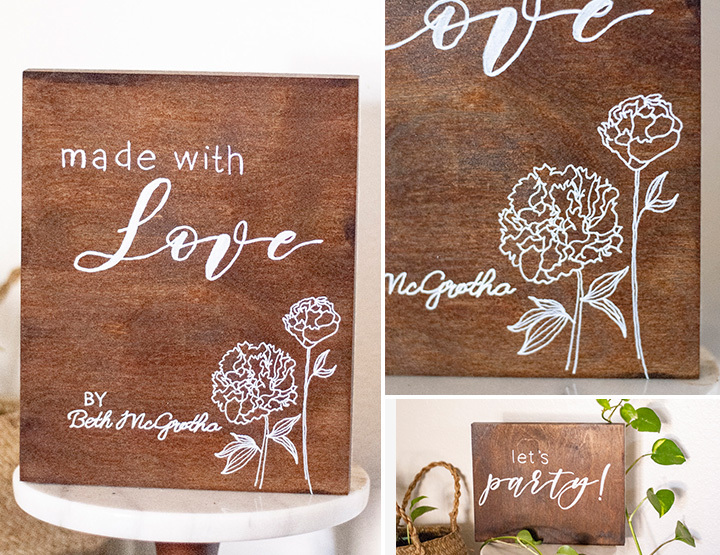 Personalized wooden wedding signs are some of my favorite items to create. For Caroline and Brett’s Tallahassee Garden Club wedding, she wanted a few different signs to display. The biggest wedding party sign I’ve made to date, I love how this sign turned out for Caroline and Brett. Their wooden wedding party sign was 24×36 inches, or 2×3 feet. 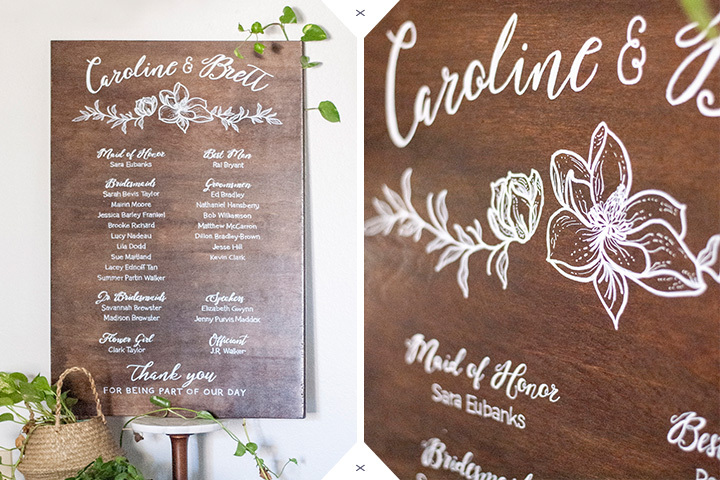 It features a beautifully hand-drawn magnolia blossom and botanical leaves to match their garden club wedding theme. I also love how she requested that at the bottom, we also include a thank you wedding sign area. This beautiful personalized wooden wedding sign turned out great and was a wonderful way to welcome guests as they arrived. A family member near and dear to Caroline made their wedding cake, so they wanted to be sure their guests knew that. What a wonderful way to share in that joy, with a personalized wooden wedding sign that was displayed on their cake table. This featured a hand-drawn peony to match her garden wedding theme. This sign had a fun purpose! Caroline’s cousin was going to walk down the aisle with them after they said their vows and hold this sign up, letting everyone know it was time to party! This fun wedding reception sign as 8×10 inches, same stain and polymer coating. But this wooden wedding sign featured two brackets to tie ribbon to, so it could be held easily. How fun is that? All of my signs are made with project-grade wood (not contract grade wood, which has chemical coatings and smells horrible). I cut to size, sand the edges, apply a dark stain, usually Jacobean or Espresso. I use darker stains so the white lettering shows up best. It can always be opposite too, natural light wood with darker lettering. Once I finish hand lettering and hand-drawing your wooden wedding party sign, I seal it with clear polymer so the design doesn’t smear and it’s weather resistant too! Lastly, I cover the back with felt so you can hang it on your wall once the wedding is done without having to worry about it scratching. 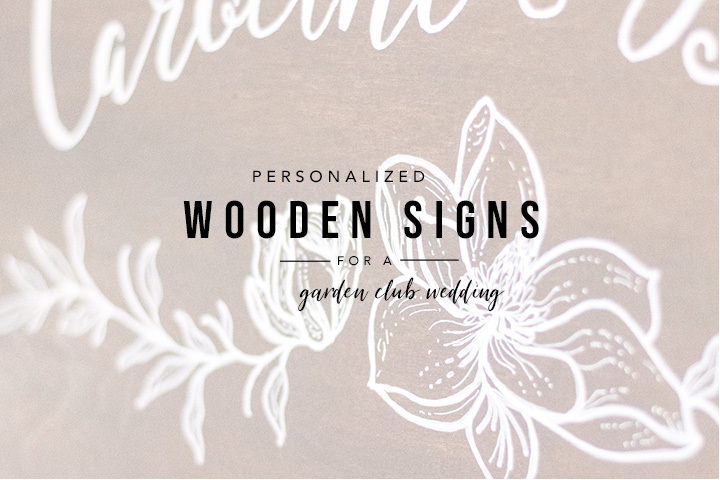 If you’re interested in personalized wooden wedding signs, or personalized acrylic wedding signs or personalized paper wedding signs, let’s chat! Every project is unique and requires its own wedding sign pricing package. So tell me your needs and we’ll work something out!